FAACT's Sixth Annual Teen Retreat weekend is all about pre-teens, teens, and college students, their siblings, and their parents. The weekend offers an informative program full of fun activities. Teens will learn about managing their food allergies and, more importantly, spend time with peers who have food allergies (and siblings who do not). Siblings are also affected when a family member has food allergies. Our Teen Retreat is a safe place for them to discuss their concerns with a group who not only understands but can share their own experiences, advice, and solutions. Teens, college students, and siblings must be between the ages of 11 and 23 to attend the Teen Retreat. It is important for college-aged teens and young adults to be included as well – they can act as mentors to the younger teens and also have the opportunity to connect with their peers and discuss managing food allergies in college. All teens will be together for some sessions for mentoring aspects, and then there will be breakout sessions for middle school, high school, and college. Parents are in session all day on Saturday learning from healthcare professionals, parent advocates, teen advocates, and Parents have time to bond and share stories during both evenings, as well, while the teens are participating in the social events. There will be an Expo and additional sessions for parents while the teens are in session on Sunday, including time to socialize and meet the sponsors. All sponsors will have a presence at the Expo to distribute literature, materials, and samples. To close the weekend, there will be a special parent and teen session together, which is very moving and a wonderful way to end the weekend. It is an inspirational and empowering weekend for the entire family that you will not want to miss! Curtis Zimmerman has always been a huge hit with parents and teens at conferences. Having celiac disease himself, Zimmerman relates to the challenges faced by food-allergic groups and is very engaging. “We are thrilled to have Curtis join us each year for FAACT’s Teen Retreat,” says FAACT CEO Eleanor Garrow-Holding. “Not only will Curtis be delivering the keynote at the Opening Ceremony, he will also be conducting two, 90-minute interactive sessions on Saturday morning – one with teens and one with parents. It is definitely going to be an inspirational, empowering weekend for all." Both as a speaker and author, Curtis Zimmerman has reached more than one million people around the globe with his life-changing messages and award-winning programs. Curtis is an expert at transforming organizations by inspiring individuals to live their lives at a higher level of performance. Curtis’ unique combination of humor, personal stories, and interactive activities affect an audience like no other. 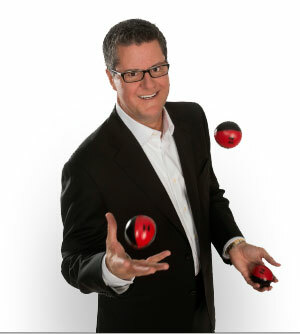 He started his entrepreneurial career at the age of twelve, marketing and self-managing himself as a mime and juggler. He was a nationally recognized mime performing at such notable places as Universal Studio-Hollywood, where he won Entertainer of the Year; Caesars Palace in Las Vegas; and performing arts centers coast to coast. He then took to the seas, performing on numerous cruise ships traveling all over the world. His deeply profound insight and perspective coupled with his high energy presentations have made him a highly sought out speaker for more than 20,000 airmen for the United States Air Force and among such notable companies as Walt Disney Entertainment, Swiss Army Brands, Luxottica Retail, and Procter and Gamble.